Everything you have always wanted to know (and more) .... about raising multilingual children. Some of my favourite bloggers share their tips, ideas and fun stories about raising little bilinguals around the world. We all hope to inspire and empower you on your long but rewarding road to multilingualism. This page is updated everyday throughout February when bloggers publish their articles. or Facebook for daily updates. Marianna from Bilingual Avenue lists many ways to stay accountable to your family’s language objectives. Tamania, Urdu Mom, summarises the main benefits of being multilingual. Linda, from Hispanic Mama, explains why cultural trips (whether near or far) are fabulous for little bilinguals. Chontelle, from Bilingual Kidspot, explores questions parents need to consider and make when raising bilingual children and the decisions they need to make. Ashley, from Family on the Loose, explains how her children in Spanish immersion get to explore the world thanks to languages. Johanna, over at Mama Tortuga, highlights some of the fun things bilinguals can do. Rita, from Multilingual Parenting, tells us how important grandparents are for multilingual children (even if they live far away). H is for ... Helpful or Hindrance? Mariam, And Then We Moved To, writes about whether being a multilingual mum is helpful or not for raising multilingual children. Becky, at Kid World Citizen, and her family share their amazing summers of Spanish language immersion abroad. Elisabeth, from Spanish Mama, reminds us that our journey to a multilingual family should be a joyful one. Anna, over at Russian Step-by-Step, shares her changing family story and how raising a multilingual family is a balancing act. Souad, BabelKid, shares her life lesson and tips to avoid falling in the trap: do not judge a (bilingual) speaker on their appearance. Ute, Expat Since Birth, shares her tips and things to consider for a monolingual parent to raise multilingual children. Olena, Bilingual Kids Rock, explains what every single parent raising multilingual children know: creating a need is crucial. O is for ... Oh my! Orana, from Crazy Little Family Adventure, shares her family's experience with multilingualism and, in particular, mixing of languages. Monica, Mommy Maestra, encourages us to always persist in raising multilingual children. Jennifer from Spanish Playground explains everything you have always wanted to know about reading in bilingual children. Galina from raising a Trilingual Child has a wealth of tips and ideas to support your multilingual children. Frances, from Discovering the World through my Son's Eyes, has wonderful tips for your bilingual (pre-) teens. Becky (Rue du Belvedere) shares a lovely post article on their family strategy: minority language at home and the issues around understanding people. 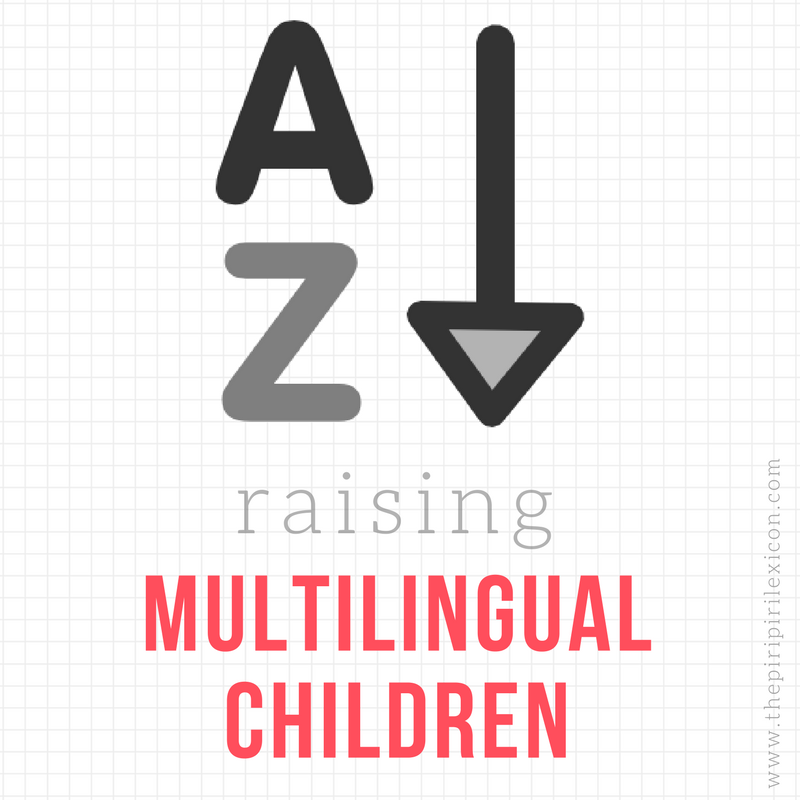 Varya, from the Creative World of Varya, lists the many different ways to raise multilingual children. W is for ... Wow! Amanda, aka Miss Panda Chinese explains how wonderful it is to raise little bilingual wonders. Aysh, Jeddah Mom, explains why learning languages is about more than just raising a bilingual child. It is about fighting xenophobia. Esther, Third Culture Mama, tells it like it is if you are considering moving internationally for your kids' languages. Leanna, from All Done Monkey, shares this fun and light-hearted post about how similar raising bilingual children is to playing Minecraft. Yes, yes, yes.... I love reviewing bilingual books. Sounds like a fantastic idea and resource! Will definitely be following and hope to contribute one day! !